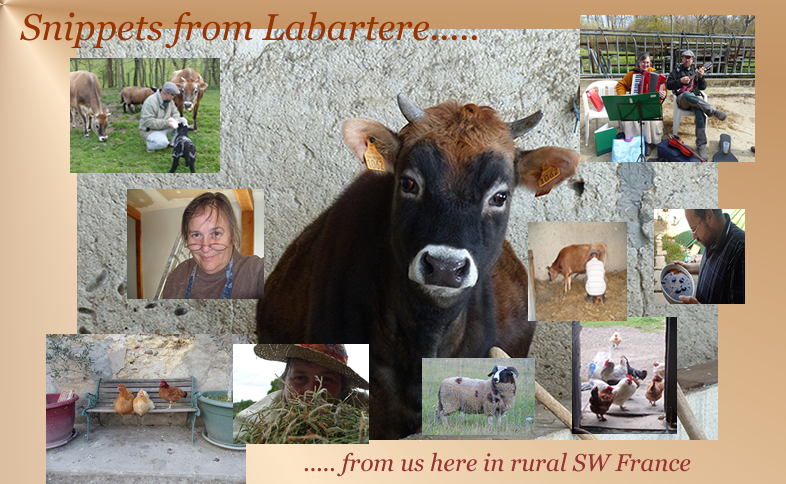 Snippets from Labartere: So it's done! With boldness I share with you my first vlog. Much improvement needs to be made, but first steps, that is what this video reflects. The video is unscripted, because that is what it had to be. To have scripted it would have made it too wooden in texture. I was nervous enough as it was, so it was better to have wandered my way through the video rather than followed a proper trail! Well done on your first pod cast, I have never watched one before so have nothing to go by. I like the idea to keep you accountable for the projects you would like to make. I hope to see progress on the jacket in the near future lol....I'm sure you will relax with filming as you get more confident. Your little farm and lifestyle sounds great. Hi Vera, Nice to hear your voice. Your podcast reminded me of fireside chats. Thank you. DENISE, bless you, ....and thanks. I remember those days as well. Can you email the link to your blog, as I can't find the most recent one. Would like to see what you are up to as well. TILLY, well......the jacket is not progressing at all at the moment because I have spent the last few days working on the computer, but I shall get a move on with the jacket now that I have committed myself to getting it made! JENN, will be working on the jacket soon. Now I have committed myself I had better get it done! I use a Panasonic DMC FZ200 camera, and it seems to film alright. Other podcasters use camcorders. I don't film with a phone yet, but other podcasters do, using the phone to record themselves when they are out and about, the cameras being too heavy to carry with you unless you are going to take the tripod along with you on which to set it up on. I don't have a phone at all, but will eventually get one so I can take footage of when I am out and about in our area of France. Hope that helps. Are you thinking of podcasting? ALLY, Thank you so much for your kind words. I felt very nervous posting this first podcast up! And how wonderful that you are similar to me....I also am a healer, although do not mention it much on the blog, but will on the podcast eventually. It is nice to know that there are other similarities between us as well. And you live in France, although are quite a distance away! JANINE, I am so glad that found the podcast to have a comfy feel about it, which is why I did not tidy up either myself or my home! LOCAL ALIEN, thanks, and I shall definitely make another podcast soon. Hi Vera, loved your podcast. Really nice to put a face and a voice to what I have been reading on your blog from the beginning. Hope you find a few minutes to make a start on Lester's jacket. It's getting started that is the main thing. Looking forward to your next podcast! Your first podcast/vlog was delightful! And, look, you already have a good number of followers who will keep you on task! ;o} Years ago, I found myself quite alone working at my endeavors of homemaking and doing various crafts such as you mention. This was before blogging or any kind of home computers and I became quite stale and almost depressed with no one to share my interests or keep me accountable for my accomplishments. So I know exactly where you're coming from in looking for like-minds folks to share all this with. Keep it up. You are funny and warm and cozy and interesting to see and listen to. Looking forward to your next podcast. AND progress on Lester's sweater/jumper/jacket/coat. Well done Vera. I look forward to seeing more of your vlogs. My word Vera, you´re more delightful live than on the page, so to speak! Good for you for diving right in. I look forward to each and every episode. We´re rooting for you to get through all your stored inventory. Congratulations and best of luck to you and Lester getting through these last chilly months. DIANE: I am sorry that your internet speed is not fast enough to allow you to watch the video properly. Hopefully your area will get that speed up to speed soon! JANICE; I am starting on the jacket tomorrow (Monday)....you are right....it is getting started which is the hardest thing, and it is the comments I have had which are encouraging me to make that start! MAMA PEA; Years ago I, too, faded away with crafting because of not having the stimulation of being in contact with other crafting people. But 2018 saw me connecting with my crafting again as I found the Youtube crafting community, and read blogs such as yours. Thank you so much for your kind words, and I intend to start the jacket tomorrow....and since I have now committed myself to doing so I flipping well shall! COCO; I am making a start tomorrow (Monday), as I really need to get a move on with getting the table cleared off, as I am having the urge to get the seed packets sorted out and I need the table to put the seedlings on! Hope your sogginess does not slow down your own seed planting too much. .... and thankyou for taking the time to write such a lovely comment. Yay! Very good. I loved it and can't wait to see what you do next. Since I'm not a native speaker of english, and I'm not used to listen to english on a daily basis, I found it difficult to follow your speech. The idea of a vlog, however, is great. I did one myself once and I might do that again. You look very nice in it, and as 'practice makes perfect', I'm sure the next ones will get better and better. By the way, there's an english blogger, about your age, who calls herself Meanqueen; she writes mainly on frugality and crafts and she's done a ltot of these vlogs on Youtube. (I can't follow her speech either, british accent is hard on me). DUTA, thanks for the link, Duta.... and thanks for visiting the vlog. You were the first person to make a comment on my blog nearly ten years ago, which started off my network of bloggers, so you are always special to me. I'm glad and flattered you remember me as being "the first". I'm also glad you find Meanqueen interesting. She's got a lot of loyal followers that appreciate her advice given both on her blog and on her youtube videos. She's also advocating long walkings and keeps track of the walkers' mileage.